this week at Scrapping the Music we're doing Stevie Nicks (& Don Henley) Leather and Lace! I was never a Fleetwood Mac/Stevie Nicks fan growing up, but I sure love Stevie's music now. ironically I know so many of the lyrics! must be from all those high school (slow) dances! after I made this, I had to question what exactly was I communicating? are my feet fragile and I need to handle them with care? 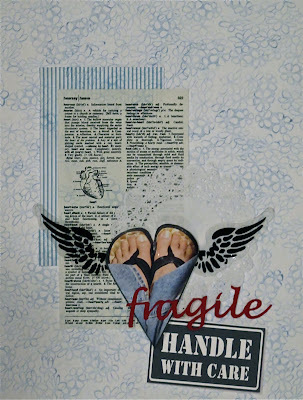 what isn't obvious is the message that my heart is fragile and I need to handle it with care. anyway, check out the design team's work and come and play along!!! I remember the boot... I'm thinking you meant the feet! lol!! I loveeee this!! HA. You are too funny. I saw it as your heart is fragile right away, and it's such a beautiful page. I love how you added the dictionary page and the wings. Me too! I saw it as your heart is fragile! such an adorable page - nice feet, too! LOL! I remember those slow dances in high school! Great page, Linda! P.S. I have been meaning to tell you - thanks for putting the STM design team on your blog!!!!!! You always amaze me...so glad you did this...beautiful!